The mysterious engineering problem causing F-22 Raptor pilots to choke in their cockpits has been solved, the Pentagon says. And it’s not the nearly $400 million aircraft’s fault after all. The problem lies with a valve in the pressurized vest pilots wear as they fly the jet at high altitudes, Pentagon spokesman George Little said. The valve inflated the vest, limiting the pilots’ oxygen supply. It does not appear that the vest was affecting quality of the oxygen in the Raptor. The valve will be replaced; the garment’s use will be “suspended,” Little said. Additionally, the Air Force has decided to remove a filter it placed in the jet to test the oxygen quality. Ironically, the filter ended up limiting the oxygen supply to the pilots. But the charcoal filter resulted in “no oxygen contamination,” Little told reporters at the Pentagon on Tuesday. Accordingly, the Air Force will gradually take its premiere stealth jet off of the probation that the so-called “hypoxia” incidents — a term indicating problems with the oxygen in the cockpit — necessitated. Over an unspecified period of time, the F-22 will no longer be restricted to flying short missions at low altitudes near air bases. The first indication that the jet is off probation will be an imminent flight of an F-22 squadron over the Pacific to Kadena Air Force Base in Japan — which will occur at a “lower altitude,” Little said. Since the Raptor was introduced into the Air Force fleet in 2005, it has been associated with 23 hypoxia incidents — the most recent of which occurred just this month in Hawaii. Hypoxia contributed to at least one pilot death, of Cpt. Jeffrey Haney, over Alaska in November 2010, although the Air Force officially ruled that a “pilot error.” Congressional inquiries later determined that the F-22 Raptor recorded nearly 27 hypoxia incidents for every 100,000 flight hours, a rate vastly higher than any other aircraft. Air Force engineers have struggled for months to understand the source of the hypoxia problems — a black mark for an expensive airplane. 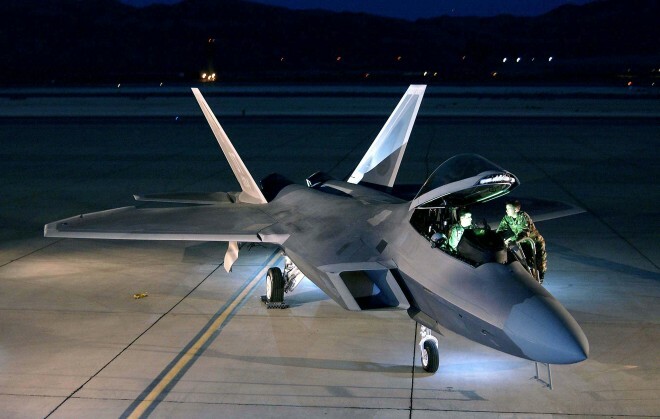 (Figuring out just how expensive the F-22 is depends on how you count.) The Air Force briefly grounded the F-22 airfleet twice in 2011. In May, Defense Secretary Leon Panetta stepped into the engineering mystery by restricting its flights and ordering a new backup oxygen system installed, which should be complete by the end of the year. The restrictions occurred on the back of a 60 Minutes report featuring two F-22 pilots, Cpt. Josh Wilson and Maj. Jeremy Gordon, who told the program that the “vast, silent majority” of their colleagues consider the Raptor unsafe to fly. The Air Force pursued disciplinary action against Wilson. Updated 3:40 p.m. to include remarks from Gen. Schwartz.